Learn how to milk a goat, and you will have your own source of fresh, healthy milk for you, your family and a neighbor or two. Most people think of cows when it comes to milk, but goats are easier to handle, less costly to feed and require far less space. 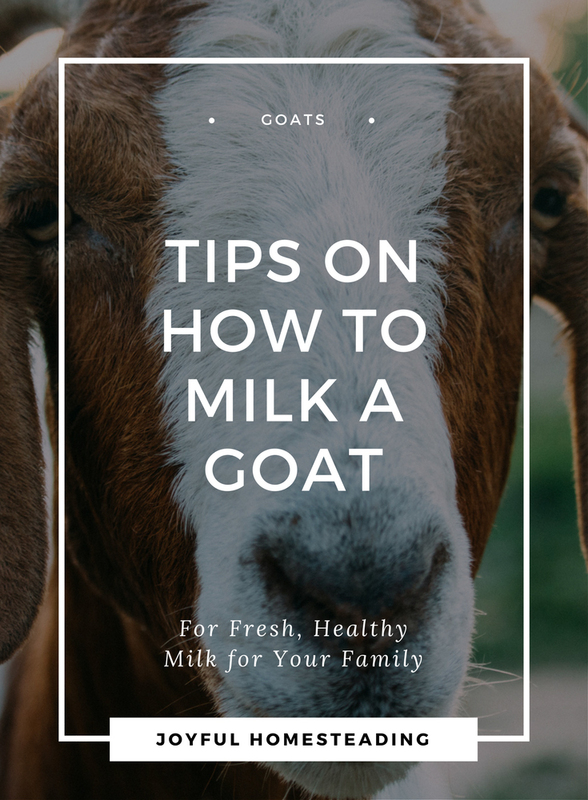 Just keep in mind that if you do want your own goat milk, you'll need to invest in a herd of a larger breed of goats, such as the Saanen or nubian goats. The dwarf goats are cute and make great pets, but you'll get about a cup of milk each milking. I personally didn't find it worth my time. That being said, here are some tips on milking a goat. If you want to know how to milk a goat easily, a milking stand is essential. Goats aren’t known for their cooperative nature, and they won’t stand still on their own to allow you to milk them. Plus they're small and hard to get under. A platform lifts you up and gives you room for milking. If you're handy with a hammer, you can build a milking stand. Find the plans here. Train your goat to jump up on the stand by offering her a treat of beet pulp. It will taste like candy to her and help increase her milk flow. A small bowl of it will also keep her calm and happily busy while you milk. Also place the stand in a quiet place without other distractions. 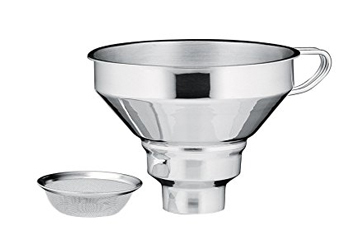 A milk strainer like this one will keep your milk clean. A stainless steel pail is essential to protect your milk from harmful bacteria. Don't use aluminum containers because they can get scratched, and it will be impossible to clean the bacteria out of the scratches. Don't use a plastic pail for the same reason. Also invest in a strainer that can hold disposable strainer pads and store your milk in quart-size glass jars or a stainless steel container. There is concern about raw milk being unhealthy because of the risk of e-coli or salmonella poisoning. This risk is greater with cows because of the type of manure cattle produce, which is wet and sticky. If a cow accidentally lies down in a pile of manure, it will get on her udders and could get into her milk. That's why it's important to know the farmer if you plan on buying raw cow's milk to ensure he is following clean practices. That risk is diminished with goat's milk because goat's manure is typically dry little pebbles that aren't as likely to stick to her underbelly. All the same, play it safe by cleaning her udders with either a damp, clean cloth or udder wipes. Those first few squeezes may contain bacteria or solid materials you won't want in something you plan to give to loved ones. Also, if your product is pink, that's a sign your milker has mastitis. Observe those first few squeezes and then throw them out. Place your thumb and forefinger at the top of the teat near the udder. Squeeze gently, but firmly. This will keep the milk that is in the teat from back flowing. Now bring in your other fingers. First your middle finger, and then add the ring finger and finally the little finger. Bring each finger down a fraction before the next. Do it right, and a white stream will appear. Never pull down on the teats. Use both hands, squeezing one teat and then the other in a rhythm. Keep at it until the udder is no longer full and you can no longer squeeze out any liquid. Remove the pail and then wipe the teats again. If necessary, add udder cream. By the way, udder cream is a great skin softener for humans too. That's all there is to how to milk a goat. Don't let your precious milk stand outside while you finish your chores. Instead, store it immediately in a refrigerator, preferably on the bottom shelf. Your goal is to cool it down to 38 degrees Fahrenheit within an hour of milking. Also, don't add fresh milk to cold milk. And finally, if you do store your milk in glass jars, keep them out of the light to preserve the flavor. Never let milk dry on your equipment. Instead, rinse everything with cold water - not hot as that could lead to a buildup. Then rinse your equipment again with warm water and an alkaline detergent (you can find one here) to remove all fatty acids, protein and bacteria. About once a week, use an acid detergent (find one here) to remove the milky deposits on your equipment. Afterwards, use a stiff brush and wash your equipment in hot, soapy water. Rinse your equipment in lots of hot water treated with either bleach or iodine. Invert your equipment on a rack and allow it to air dry. Do not dry with a towel. 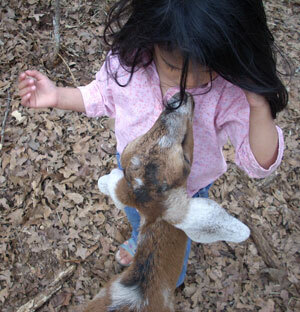 Related article: Find the right breed of goat for you.